The media, which really likes simple explanations for complex events, has dubbed this the “Trump Rally”. I’m inclined to think that the anticipated changes to corporate tax rates, the regulatory environment and infrastructure spending are largely offset by uncertainty about what we are really going to see and when those changes might actually materialize. I see this rally as being fueled by the removal of election uncertainty, the typical bounce we see in the market this time of year, and the steady stream of very positive economic news. Either way though, I will take it. Two other common areas of discussion are the strong performance of the TSP S Fund since the election, and how far this rally can run. The TSP S Fund has had a great year, up 18.57% through today, and up 9.43% just since the election. A fair number of readers have watched it sprinting ahead of the TSP C Fund and rightly wondered whether we could have predicted that, and having failed to do so, whether we should be moving that way now. I just want to reiterate that the Business Cycle Strategy doesn’t predict what is going to happen in a given month or quarter or year. What it does is show what has happened on average in the past during similar economic environments. Of course there are a lot of other things pulling the stock market in one direction or another, so while I think it gives me the best opportunity to do well during a typical year, I accept that the indicated fund isn’t going to be the best performer in many years. And that’s okay with me because I am invested for the long term, and over the long term I believe this strategy will average out to the highest returns. So could we have seen this coming? Sort of. From a valuation standpoint (looking at price to earnings (P/E) ratios), the TSP S Fund was cheap compared to the TSP C Fund. At some point, all of these ratios are going to come back towards their average (this is what they call reversion to the mean). So as an example, if Fund X’s P/E ratio is 20 but it’s historical average is 15, it is a pretty safe bet that at some point Fund X’s price will either fall back towards that average or stay flat until the earnings of companies in Fund X rise enough to bring that ratio back into line. But of course historical averages span all of the phases of the business cycle, so you wouldn’t sell a stock fund during the recovery phase of a cycle just because it had a higher than average P/E ratio – it is supposed to be higher than average during that period in anticipation of higher earnings, just as it is lower during recession. And that’s the same reason the S Fund’s valuation relative to the C Fund is interesting, but not typically something which will cause me to adjust my strategy late in the business cycle. I expect the C Fund to outperform the S Fund during this phase, so I expect the C Fund’s P/E ratio to be further from its average than that of the S Fund. 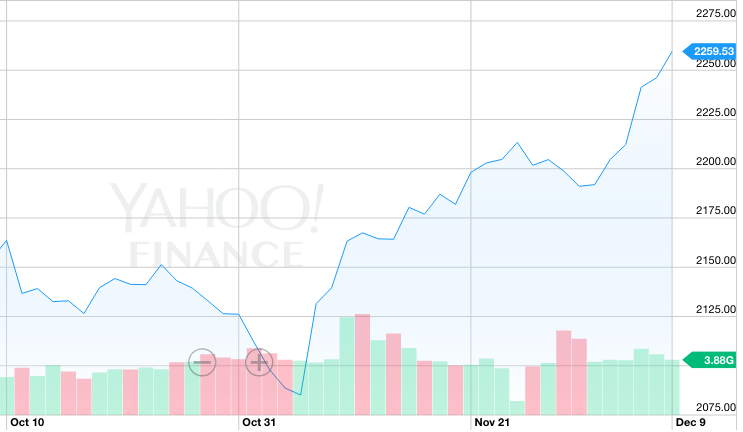 The TSP C Fund was fully valued as we went into the election. That part of the stock market is seen as safer, so that’s where the money had been going. After the uncertainty was removed and the markets rallied when the election was over, the “risk-on” trade kicked in and cash flooded towards that “undervalued” part of the market. There are some analysts making the case that these smaller companies do more business domestically so they might do better under Trump than the huge multinationals which dominate the TSP C Fund. I think a lot of that is trying to find a complicated explanation for something which is really pretty simple. And remember, we aren’t talking about small business here: the average market value in the TSP S Fund is over $1.3 billion. So should I move some of my allocation to the TSP S Fund? 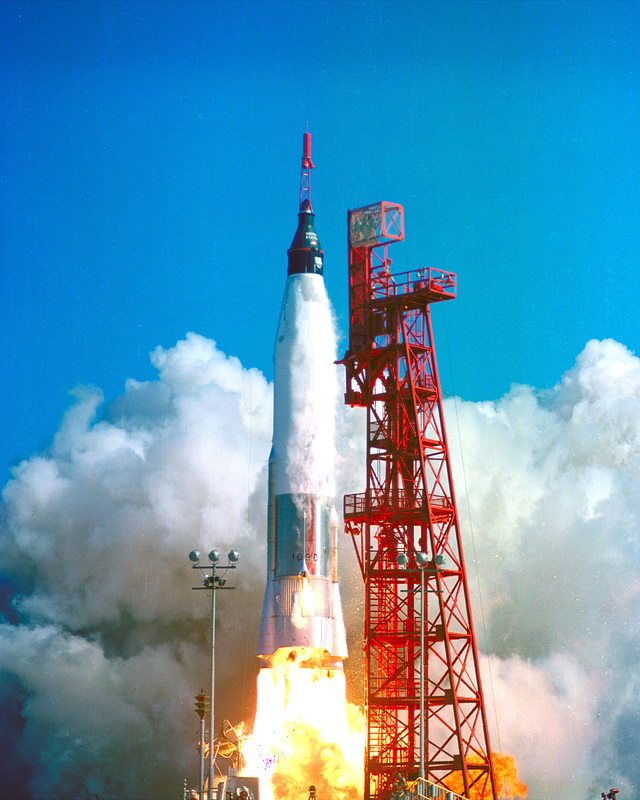 One of the absolute axioms of investing is “Don’t chase performance.” Study after study has shown that when investors try to invest in sectors of the market after a period of high performance, they almost inevitably do worse than they would have if they had stuck with their current investment strategy. (The exception is when radical innovation creates new markets and massive long-term growth in an area (the internet, mobile telephones, etc.)). The S Fund has caught up and passed the C Fund from a valuation perspective – the P/E of the S Fund is 20.3 compared to the C Fund’s 19.4. The S Fund may well still outperform the C Fund for a while, but I don’t see an argument for that to continue long term. A rising market breeds optimists, and there are plenty of them out there suggesting that infrastructure spending and lower corporate taxes will usher in a period of sustained growth. Both of those changes would be positive things for the stock market, but there is a limit to what we can expect. The chart below demonstrates pretty dramatically what typically happens when the US economy is at full employment. Chief among the reasons for the drop in returns is that when the economy is at peak performance (and no, peak performance does not mean optimal performance), interest rates rise. When interest rates rise, investors looking for safe returns move to the bond market. It is hard for investors to convince themselves that bonds are a good idea when interest rates are lower than inflation. But as rates tick up, more and more capital will switch to bonds. I am very confident the Fed will raise interest rates next week. That 1/4 point hike won’t have the effect I described above – it will take many more hikes to divert a lot of money from the stock market. But it will take a little bit, and another rate hike in the Spring will take a little bit more, and eventually that will put a cap on money flowing into the market. Long term, I don’t see a catalyst for unusual growth which would “reset the business cycle” and fuel a new bull market. There is some talk about a manufacturing revival in the US among politicians, but note that nobody is talking about that in the financial world. In 1800, 98% of Americans lived on farms. In 1900, 30% of Americans lived on farms. In 2000, 2% of Americans lived on farms. I am old enough to remember the politicians pandering to the idea that the family farms were going to come back and things were going to be like they were in “the good old days.” That is exactly what we are going through with manufacturing right now, and the result is going to be the same. There will still be huge quantities of goods manufactured in the US in certain industries, but it will be a small fraction of what it was. Don’t get me wrong, I’m not selling my stock holdings and looking for alternatives. But I think we are unlikely to see many years of double digit returns in this phase of the business cycle. I hope to be wrong as much as anyone, because I suspect I will be fully invested in the stock market for the entire year. Shorter term, as always I will fearlessly predict a 5% correction at some point in the next 30-60 days, just because most of the time I will be right when I say that. In this instance, I think it is even more likely than usual after the recent run up. This isn’t something which we can predict accurately enough to do anything with from a trading standpoint, but knowing that it is inevitably going to happen keeps us from being stressed when it does. I assumed I would find an exit point from the TSP I fund every month since the Brexit vote, but it made a strong move up following that vote so I stuck with it short term. That run has clearly ended, and I never like to play timing games in my TSP anyhow, so I will change my allocation and contributions to 100% TSP C Fund tomorrow. If you need a refresher on the I Fund, take a quick look at this post in which I explain the TSP I Fund in some detail and talk about when I think it is a good investment: The Role of the TSP I Fund in TSP Allocation Strategy. Employment numbers: Total nonfarm payroll employment increased by 178,000 in November, and the unemployment rate fell to 4.6 percent. I obtain this data from the Bureau of Labor Statistics. We are in the full employment range, so at this point we also glance at some other numbers like wage growth and number of people entering/reentering the workforce to gauge whether things are still moving in the right direction. But for the most part, this indicator is pretty well played out for this business cycle until we see several months of job losses in a row. Manufacturing expanded in November as the PMI registered 53.2 percent, an increase of 1.3 percentage points from the October reading of 51.9 percent, indicating growth in manufacturing for the third consecutive month. A reading above 50 percent indicates that the manufacturing economy is generally expanding; below 50 percent indicates that it is generally contracting. 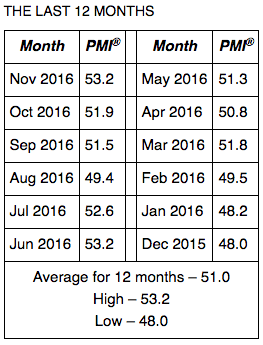 A PMI above 43.2 percent, over a period of time, generally indicates an expansion of the overall economy. Therefore, the November PMI indicates growth for the 90th consecutive month in the overall economy, and indicates growth in the manufacturing sector for the third consecutive month. The past relationship between the PMI and the overall economy indicates that the average PMI for January through November (51.2 percent) corresponds to a 2.5 percent increase in real gross domestic product (GDP) on an annualized basis. In addition, if the PMI for November (53.2 percent) is annualized, it corresponds to a 3.2 percent increase in real GDP annually. 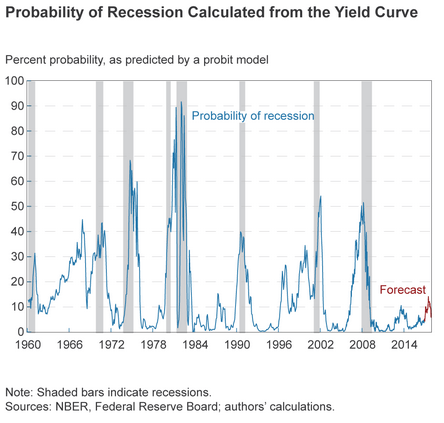 Using the yield curve to predict whether or not the economy will be in recession in the future, we estimate the expected chance of the economy being in a recession next November at 5.88 percent, down from October’s estimate of 9.24 percent, itself a hair below September’s 9.27 percent. So the yield curve is optimistic about the recovery continuing, even if it is somewhat pessimistic with regard to the pace of growth over the next year. All of which leads me to believe that we remain in the Mid/Growth/Performing stage of the business cycle and so I am going to allocate all of my balances and contributions to the TSP C Fund. This month’s recommended book is Irrational Exuberance by Robert Shiller. Shiller doesn’t set out to tell you how to invest, but rather how to think about investing. Shiller did a pretty good job of predicting the bursting of the tech bubble in 2000 and the housing crisis, and won the Noble Prize for economics in 2013 to boot. He is one of the big brains in this space and is well worth reading. Once again this month, I want to highlight a very small business which I like and perhaps have a positive impact on them. 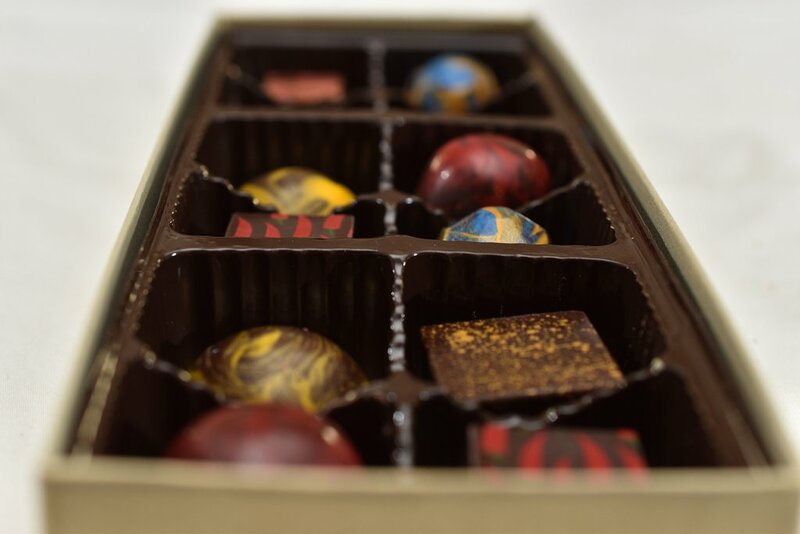 Sweet Passages is a brand new website for a very high end artisanal chocolate maker. Her product is beautiful food art, so it is a big step up from regular chocolates as a gift, and is also really delicious. I wound up with a box because the chef is a friend of a friend of a friend, and now it will be one of my standard gifts. your info has improved my TSP fund by 6.8%. Thank you. I stayed 100% in S fund throughout the elections. Should I stay or move? I am still holding 100% in the G fund after moving it all from the 2040 fund the day after election day. Should I just hold tight for a market correction before moving it again? FAQs number 2 and 3 cover my thoughts on that reasonably well: http://www.tspallocation.com/faq/#number2 (note that in #2 when I talk about “mistakes”, I don’t mean that I think you made a mistake – in this case things just went very differently than anyone expected). Stayed in S fund all throughout elections. Should I stay or move? You did better than I did if you have been in the S Fund lately, so maybe I should be asking you. Over the course of the business cycle I am in the S Fund more than all the other funds combined, but I think the odds favor the C Fund long term given where we are in that cycle. Great info as usual. Where do I find P/E ratios of the TSP funds? I pull up the mutual fund or ETF equivalent to the TSP fund on any of the financial websites. I have a list of Vanguard funds which track the same indexes under Resources. I checked the corresponding funds on Vanguard and the P/E numbers are a little higher than what you mentioned. For example, the current P/E as of 11/30/16 for F, C, S, and I are 21.4, 22.7, 33.2, and 30.7 respectively. Are these numbers correct? Can you please list the historical average P/E for these funds? Thank you! Always good info from you, thanks. I was 50/50 in S and C Funds for most of 2016 after getting out of I. Should I continue with this even split? I’ve had my TSP 50/50 in both C and S funds. I did very well this year. I just joined this site on advice from a co-worker and look forward to the information. TS Paul any thoughts on allocation for retirees? I follow your recommendations most of the time with my funds not in G but I do have 25% of my TSP in the G fund because I am retired. So I’m currently 25% G, 75% C. No plans to change right now but wondered about your thoughts on the need to protect some funds due to retirement. I’m wondering the same thing. I keep about half of my funds in the G fund since I’m pretty risk averse at this point. I too am retired and felt a need to reserve some money in the G Fund, not so much for a rainy day, but for a 2007-2008 type market. I wanted to have the ability to draw funds from the G Fund while the other market funds (C, S, I) recovered. This strategy worked well for my elderly mothers’ portfolio that I was managing through Fidelity Mutual Funds. I would like to do the same thing with my TSP portfoilo, but the rules state that the monthly funds drawn from your account are proportionally taken from the same funds/percentage as your TSP balance. I made a huge mistake by using my one time withdrawal option to start retirement with a clean slate by paying off a home improvement loan. I should have included funds for my safety net which could have been transferred (after paying the required taxes) to a safe mutual fund/money market with low but guaranteed returns. I heard that TSP is considering a rule change that would allow you to direct monthly distribution from your choice of TSP funds but I don’t believe that has happened yet. There may be other options available but I weathered the cost of my error by using other income sources during the past 4 years. Any suggestions for developing a safety net with a TSP account would be greatly appreciated. Right now I think the option you discuss in the second paragraph is the only way to accomplish what you want to do. I tend not to think of my money being in separate buckets, each of which is subject to paper gains and losses, so I won’t spend much time thinking about where my disbursements are coming from. Every day I have X amount of money and I think about where it is most likely to grow from there. How might Italy’s rumored bankruptcy effect the markets in Europe and US? I’ve shared your site with my coworkers at the VA many times, yet I still find that they are in the G fund. The biggest reason they stay in G is either they are afraid of the market in general or they’re just too ‘busy’ to make changes to their TSP. I continue to share this site to them but I’ve adjusted my expectations accordingly. I reckon they would rather have their latte’s today rather than steak tomorrow.